We went apple picking last Saturday. It had been YEARS since I'd been. Having a very active nearly 2 year old, we're always looking for things to do as a family that gets him out and active, and what better excuse in September than going apple picking? He loves apples, so it also serves as a little lesson in where his food comes from. Wagner Orchards and Estate Winery was recommended to us by a friend. It was perfect for us! Not ridiculously busy, equipment for Quinn to play on, apples (of course), a winery, and some good eats. I also love that it's family owned and run. We bought a bag at the shop ($10 for a 13-15lb bag) and hopped onto the tractor's trailer. The tractor took us to the Gala section of the orchard and we walked back, picking as we went. 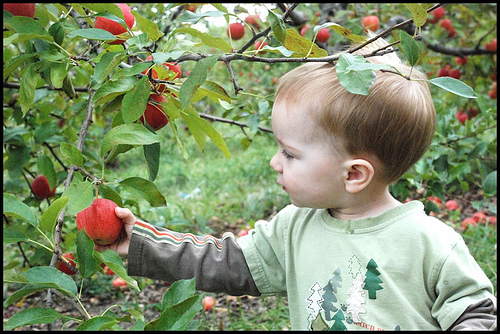 Quinn loved picking the apples (there were plenty of branches low enough for him), and tried to eat each and every one. We wandered down the path, filling our bag with delicious apples (they use very few chemicals and try to use natural pest control over insecticides, when possible). We wandered over the barn where Quinn talked to the cows. Wagner's also sells beef that's hormone and antibiotic free. They are pasture-raised (but are finished on corn...that they grow themselves). We walked across the grass to visit with the horses and donkey. We started back toward the buildings and "accidentally" wandered in through the winery door. There were a number of wines to choose from, but I was drawn to the ice fruit wines and picked up a bottle of the raspberry (they also had apple and blackcurrant, as well as some ice fruit wines blended with red), then followed my nose into the main shop. There, I was tempted by some pies, strudels, sausage rolls, homemade Mennonite sausage...I wanted to tell them to just hand me a fork and put it on my tab, but I was good and only purchased some ground beef ($3.50 a lb - I made Lazy Cabbage Rolls with some of the beef and it was incredible! ), a couple of strudels and some apple cider. We went back outside and let Quinn loose on the the jungle gym! I really enjoyed Wagner Orchards and it was a perfect pace for Quinn at this stage. It wasn't super busy, had close proximity parking, allowed him to pick his own apples and contribute, gave him a safe place to run around, offered a few extras (like seeing the cows and petting the horses...and I swear I heard a sheep around somewhere), and a jungle gym for him to play on. We're also supporting a locally owned and run family business. It was a great family outing, and we will definitely be back! I would like to comment about our experiance yesterday. 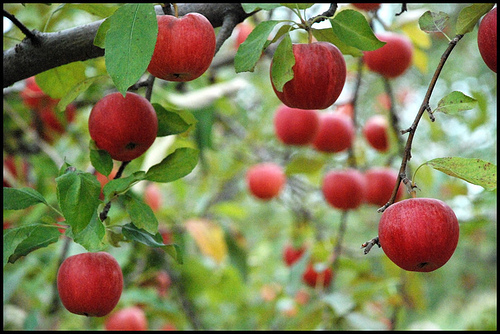 We came to pick apples as we have done for the last 4 years at your orchard. So we weent into the store and asked prices and decided on 2 large bags and 1 small for a total of $46. After we were finished we put our bags into the car and went back to the store to buy some apple cider and cake for the kids, another $20 worth. As I was leaving I heard a lady say to the girl behind the counter "is the special still on? where I can get 3 large bags for $45? ", the girls said yes. I was (and still am) upset that when I was pricing out my bags no one once said, hey you can get 3 large for a dollar cheaper. I understand business is business, but for that extra dollar and a half of bag of apples I may not return again. So you may have saved a buck and a half bag of apples, but may have lost over $60 and a customer that would tell people to goto Wagners. Sorry Steve Yesterday was busy and unfortunately someone did not tell you. It is on our sign outside, but obviously not clear enough. If you had mentioned before you left we would have been happy to correct the problem. This is not something we did on purpose but mistakes happen. If you wish to come back and ask for Harold we would be happy to give you another 10 lbs of apples and a loonie back. When things get busy stuff happens. It is not a policy. We will post this in the store as well as on the sign outside. Good enough for me. I won't be coming back for the apples or the $1. I am happy that you made the offer and you will be more aware, so this doesn't happen again. Again thank you for fixing this and offering me something back. I am happy to see that a business still care about their customers and is willing to work to fix problems. We went apple picking at your Orchard today with our family. I'd like to share what I posted on wannaknow.ca about your place! Hey everybody, just got back from Wagners today! Highly recommend buying their homemade Apple Pie! $12.00 and worth every bite! The place was abit smaller than Thiessen's, and to be honest felt abit closterphobic with their farming equipment blocking our path to their orchard. 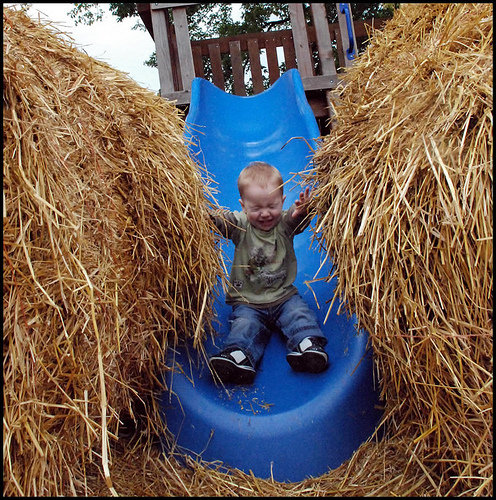 Our kids loved their playground equipment, and jumping in the hay! 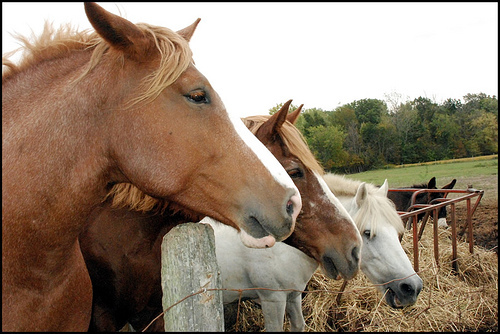 As well as feeding their friendly horses near the rear of their property. We brought a picnic lunch and the grounds were clean. We enjoyed our day together. p.s. May I suggest using some of your hay to make a path over that big mud puddle that is on the path to your port-o-john? Thanks! 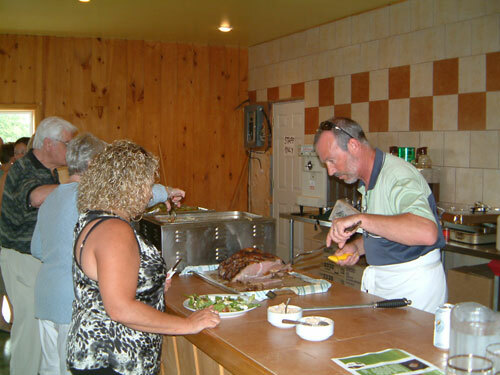 "On Saturday, June 25th 2010 we invited about 40+ friends over at Wagner Orchards Event Centre. We started the evening with sausage and cheese accompanied by two great beers; Chimay and Blanche de Chambly. Followed by New York strip steak with warm potato salad, seasonal vegetables and home made pasta as main course. The great house wine s complemented the food. To seal the deal Harold's famous Strawberry - Rhubarb pie topped with real whipped cream was to die for. As a bonus Matt had set up an area where we could all gather around a bonfire, a few good jokes were cracked and some unbelievable stories followed. I like to thank the Wagner family; we all had a great time. I will certainly refer your Event Centre.